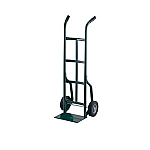 Our heavy duty-industrial strength hand trucks give you a lot of bang for your buck. These hand trucks usally come with thicker than average tubing, have extra strong welding and are built to last years and years even in the toughest enviroments. Many of them come with a 5 year frame warranty! Perfect for really extra bulky loads! Perfect for really big events! Working in a business setting where you have to move stock around can be a demanding issue for both employee and employer. The employer has to take care that they provide their workers with suitable equipment, to minimise the risk of an injury being sustained whilst they are on the job. After all, who wants to run the risk of facing a law suit for an industrial accident? These Heavy DutySteel Hand Trucks are ideal for the efficient and swift transportation of large amounts of stock in a short space of time. What makes them so helpful though is the fact that the pneumatic tires are able to withstand even the most bumpy and uneven of terrain. Regrettably, the demands of owning a business means that it is not always possible to have all the stock on a smooth gradient, or indeed, even on the same level. Therefore, if you do happen to have stairs on your premises then you can also purchase and make use of optional stair guides to ease the transition process. Handtrucks2go is the best choice for all moving equipment needs you may have.